The best spikeless golf shoes 2018 will show you their advantages over spiked shoes so that you can decide between the two. Everyone from weekend golfers and up requires golf shoes to play the game. While there are many takers for the spiked golf shoes, spikeless shoes’ technology have caught up in terms of traction. Their versatility makes them even more desirable. What’s The Difference Between Spiked And Spikeless Golf Shoes? What Are The Advantages And Disadvantages Of Spikeless Golf Shoe? How To Choose The Best Spikeless Golf Shoe? 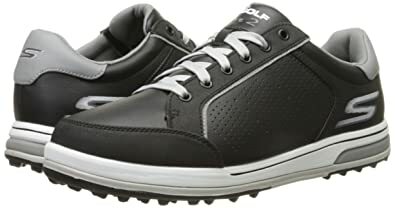 The Skechers Performance Go Golf Drive 2 spikeless golf shoes are for any golfer whose first priority is the comfort. We recommend these for playing on flat and dry or damp courses. The Goga Mat insole is the highlight of these spikeless shoes. This is a variation of the Yoga mat material and consequently a fine balance of soft and firm. After wearing spiked shoes for long durations, the Drive 2 sole felt like therapy to my feet. Skechers Drive 2 are probably the most comfortable synthetic golf shoes we have ever worn. The Goga Mat combines with an optimally flexible sole that’s rigid enough for rough terrains. After 18 holes, we could still feel our feet. The bottom of the shoe has triangular lugs on both ends and more aggressive pointy stubs in the middle. The grip is top class for a spikeless golf shoe. We tried it on damp grass and slippery hills. Not once did it fail us. The shoes remained especially stable while swinging. Richard, my partner, has a high-speed swing but his feet remained firmly on the ground while taking a shot. These spikeless golf shoes have enough water-resistance to keep your feet dry in wet grass. But we wouldn’t venture out with them in the rain. There are perforations on the upper for ventilation which allows water in. The ECCO Cage Pro Spikeless shoes are the most advanced fare in the market. And they are the closest that comes to spiked shoes in grip and traction. These leather shoes have a rather unusual SPYDR-GRIP® outsole. Instead of usual lugs, there’s an interconnected web with lugs at the joints. The lugs run deeper than the previous ECCO models. They provide excellent traction on all varieties of terrain we tested. Only the long wet rough was a little unsettling for Cage Pro. The pointy nubs of these spikeless golf shoes don’t project randomly. They stick out at pivot points and this aided the transition of my feet during the swing. The cleated shoes often get clogged with dirt. ECCO claims their sole design defies dirt and maintains the grip. The Cage name comes from a single-piece polyurethane stability frame from heel to toe, including midsole. It wraps around the heel to arrest ankle rolling and maximizes stability throughout. This is a leather shoe with a Hydromax leather upper. It gave me efficient water-resistance in the tall wet grass while maintaining ventilation. I found I could remove the top insole of Cage Pro spikeless golf shoes to accommodate my wide feet. Both soles are comfortable right out of the box. Nike FI Impact 2 spikeless golf shoes are for the folks who want to use them for multiple occasions: walking running, golfing etc. They look and feel like running shoes while fulfilling all the needs of a golf shoe. These are very lightweight synthetic shoes. They move with my foot replicating its natural motion. While making the swing, they let the forefoot move freely. But they also lock down the ankle well and provide excellent traction on dry and wet grass. They stand second only to spiked shoes in the grip. The outsole has small lugs as well as big tread patterns. I had a smooth walk on the level ground but also got necessary tread on dangerous lies. The ventilation is not compromised by the water-resistance of the upper. I had to walk through some muddy lie after a rainy day and my Impact 2 spikeless golf shoes got caked with mud. But my feet remained dry and odor-free. The investment on these goes into their sole support. Because of their slim profile and running shoe looks, I frequently wear them too long walks across the town while running errands. My feet never get sore even through different turfs. 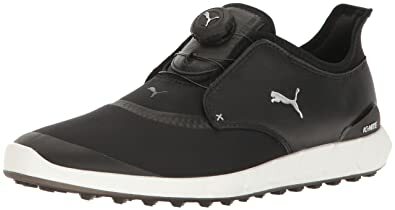 Puma Ignite Sports Spikeless golf shoes are the best on this list for the recreational golfer. We got reliable on- and off-course performance with these shoes. But we wanted to show them off more outside the course. This is a synthetic and textile shoe with leather upper. The full-grain leather may feel a little stiff at first, but we liked the way it held its form proudly. The Ignite foam of the insole is the noteworthy feature of these spikeless golf shoes. This material compresses as you step on it and then uses the energy to push your feet back up, thus supporting your walk. The outsole has small lugs as well as big tread patterns. I had a smooth walk on the level ground but also got necessary tread on dangerous lies. The back of the ankle shaft has breathable mesh which kept my feet ventilated. But it left my feet feeling less supported than a rigid golf shoe. So while I’ll don the Ignite Sport Spikeless golf shoes for weekend golfing, I use a spiked shoe for regular golfing. Because your feet can move around more in these shoes, they are very comfortable for off-course use. But the freedom of movement may not help the swing of high-torsion golfers. Adidas Adipower Boost 2 spikeless golf shoes are actually more of a hybrid. They have almost cleat-like projections on their sole but they don’t feel as unbalanced. The sole design is a tad more aggressive than any of the other spikeless golf shoes on this list. We would suggest keeping these exclusively for the course. The grip strength matched up with spiked shoes on all types of topography, in summer and showers. I also found the lugs placed strategically to support torsional traction. If you are making the transition from spiked shoes to spikeless golf shoes, these are great to bridge the gap. I found these shoes to have good lateral stability without the unwelcome elevation that the spiked shoes bring. The boost midsole of Boost 2 stores and returns the energy from your tread and aids in quick walking. EVA foam forefoot has the flexibility I require for swinging. Their climaproof technology keeps the shoes dry even in wet grass. We wouldn’t use it during rain though. There are perforations around the top of the ankle shaft that allow sufficient air flow inside. These two parameters are where these shoes should distinguish themselves compared to spiked shoes. We tested these shoes on various terrains, wet, dry, flat, undulating. We took some hefty shots using our full strength and checked if we remained stable in our positions. The most important parameter for foot health. The shoes should have enough space for the front of your feet to move and position themselves but it should hold the ankle in place. Ankle-rolling can cause long-term injury. The best spikeless golf shoes kept the lower body stable. The whole point of choosing spikeless golf shoes over spiked ones. We took long walks with these shoes and checked how they felt over long distances. Unnecessary pressure points, heavy soles, rigid soles all reduce the comfort of the shoes. We checked how the best spikeless golf shoes held up under rain and dewy grass on the golf course. Dry feet are necessary to focus on the game. Golf is a costly indulgence as it is. You don’t want to be replacing your golf shoes every now and then. We checked the condition of the lugs on the sole after persistent use. These shoes didn’t show any significant wear or deterioration in grip. The spikeless golf shoes have a flat sole with some stud-like projections or grooves. These do not actively grip the ground beneath. Rather their traction is a reaction to the force you apply on the ground while walking. If you notice, the spiked shoe has actual cleats which proactively grip the surface they are stood on. Cleats are the spidery projections from their sole that hold on tight to the ground beneath and provide lateral stability. Although most of the spiked shoes today have soft plastic cleats, the norm was to have metal cleats for extra grip. Golf legends like Phil Mickelson and Tiger Woods still use metal spikes. Many spiked shoes have removable and replaceable plastic cleats. With the current technology, there are the minor differences in the gripping ability of spiked and spikeless golf shoes. In the last couple of years, the sale of spikeless shoes has risen in the golf market because of their versatility and almost equal gripping action as the cleated shoes. Justin Rose and Fred Couples have successfully demonstrated their use in the Masters. Spikeless golf shoes are comfortable. They make you feel balanced. Spiked shoes often elevate your height and make you feel ungainly. The distribution of cleats may also apply pressure unevenly on your feet. With the spikeless shoes, the lugs are evenly distributed. They the bear your weight much better. Justin Rose, who was having trouble with his cleated shoes, switched and found the spikeless shoes much more comfortable at the BMW Championship. Spikeless golf shoes are much more versatile. Once you mark the finish line at the 18th hole, you need not change your shoes to go have a drink or shop for some groceries. If you plan on getting a short 9-hole round between errands, these are great. These shoes can be used for everyday walking. You might end up damaging the cleats on spiked shoes if you wear them outside of the golf course. The feedback from the ground is felt much clearly with spikeless golf shoes. This lends a feeling of surefooted-ness which is good at tournaments. You need all the confidence you can get. 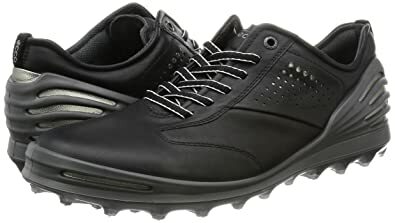 The spiked golf shoes interact with the turf mainly via the cleats. This dulls down the reaction from the ground leaving you feeling a bit unanchored. As the traction technology has evolved, spikeless shoes provide better traction in a greater variety of turf conditions. So effectively they are taking away the one great advantage of the spiked shoes. Spikeless golf shoes don’t damage the turf. Metal spikes are prone to creating disturbances on the turf surface. Some greenkeepers say that plastic cleats are worse. No matter how big the strides of spikeless golf shoe technology has been, they don’t match up with spiked shoes on wet golf courses and hilly course terrain. Cleats offer much better traction and lateral stability. The combination of high-torque swing and high weight can easily dislodge you from your carefully constructed stance. But spikes don’t let that happen. And that makes the difference between a clean and a fumbled shot. With advancement in shoe design, spiked golf shoes are also getting increasingly comfortable. For beginners, the spiked shoes might be the better option. The spikes help them lock in their feet in the correct stance. This keeps them from moving their feet through the backswing, downswing, and follow-through. Both spiked and spikeless golf shoes have their distinct advantages. The technology is approaching a hybrid design that offers great traction and support without spikes. But for the time being, it’s best to have a pair of spiked and spikeless golf shoe each. The storm of spiked vs. spikeless golf shoes debate gathers in a rush. The spikeless golf shoes have made great progress in creating superior grip and better all-round traction. Since these pride themselves in their versatility, we have covered a f﻿air few shoes that are stylish like running shoes but also capable of withstanding swing torsion. Couple of shoes with the aggressive tread pattern that perform efficiently specifically at the golf course have been included. 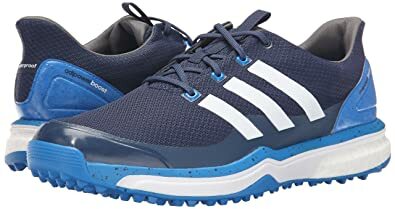 The Skecher’s Go Golf Drive 2 spikeless golf shoes are one of the most affordable and most comfortable golf shoes on the market. Their Goga mat insole is very supportive of your feet. Multiple show widths for the same shoe size help you find a form-fitting model. Top-notch grip, stability, and protection from elements earn them the top place in our best spikeless golf shoes list.